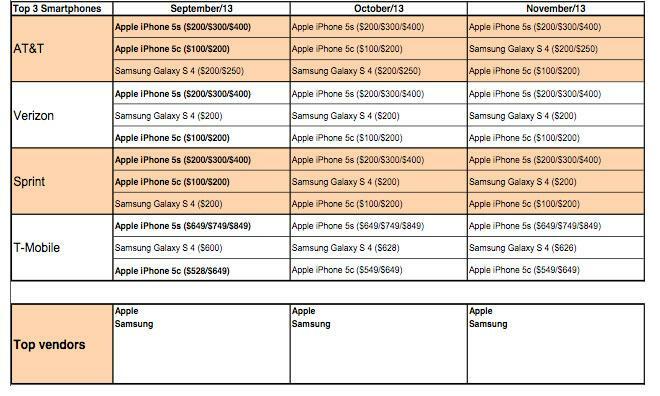 Apple continues to dominate smartphone sales with their flagship iPhone 5s and mid-range iPhone 5c as the handsets took two of the top three sales slots at every major U.S. wireless carrier for the third month in a row. The Cupertino, Calif.-based company remained America's top smartphone vendor in November on the back of 'strong' iPhone 5s sales and 'steady' iPhone 5c sales, according to data cited by Canaccord Genuity analyst T. Michael Walkley in a Thursday note to investors. Samsung notched a second-place finish in an industry that has seen major sales consolidation throughout the fourth quarter. The sales data also points to a strong showing for Apple's iPad in November. Canaccord's surveys "indicated strong Black Friday weekend iPad Air and new iPad mini sales...essentially at all channels where the iPads were available," a finding corroborated by previous analytics data that showed a boost of more than 50 percent for the new 9.7-inch tablet. Walkley raised the bank's price target on Apple shares from $580 to $600 and revised shipment estimates for the iPhone upward to 54 million units in the first quarter of the company's 2014 fiscal year and 186 million units for the entire year.